Satellite view showing Los Angeles, the sprawling Southern California city, largest urban area in the state and the second most populous city in the United States. LA is located between the San Gabriel Mountains on the east and the west coast at the Pacific Ocean. The world famous Hollywood Sign, the iconic letters atop Mount Lee in the Hollywood Hills area. Hollywood is a neighborhood in Los Angeles. The city started as a settlement in September 1781 with a population of 44. The town was named "El Pueblo de Nuestra Señora la Reina de los Ángeles del Río de Porciúncula", this name was just too long to memorize, and so it was soon shortened to Los Angeles. 100 years later after the completion of the Southern Pacific Railroad line to Los Angeles in 1876 the population has grown to more than 10,000 people. 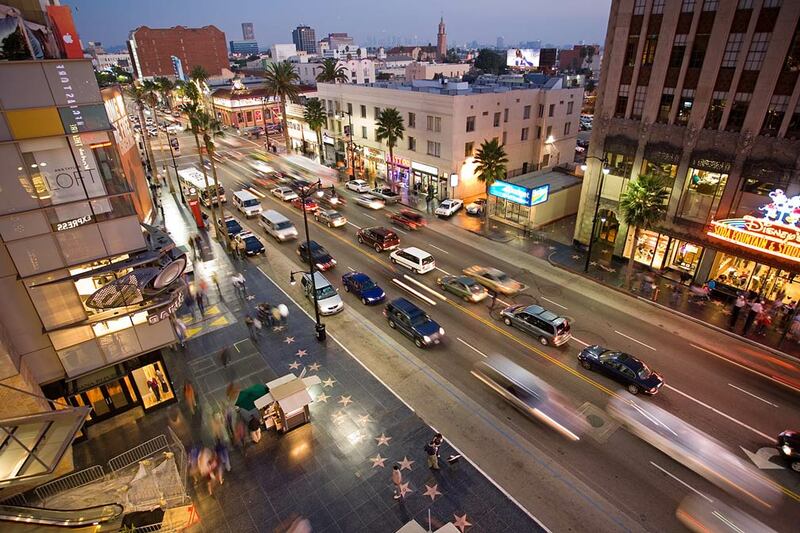 Today Los Angeles has a population of about 4 million inhabitants. 18.5 million live in the Greater Los Angeles Area (in 2015), Greater Los Angeles is the second-largest urban region in the United States. Within the Los Angeles–Long Beach–Anaheim MSA area are about 50 cities and towns, the largest are Long Beach, Anaheim, Santa Ana, Irvine, Glendale, and Huntington Beach. 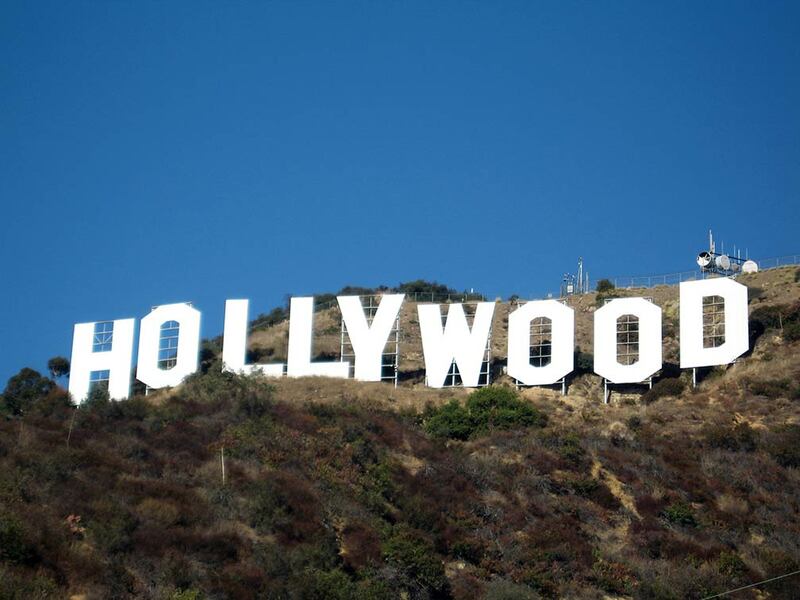 Hollywood, a district in the central LA, is known as the original movie mecca, the majority of US movie studios are headquartered in Los Angeles. The city is home to the Kodak Theatre, today known as Dolby Theatre, located close to Hollywood Boulevard in the Hollywood district of Los Angeles. The theater is home of the annual Academy Awards Ceremonies (The Oscars), which were first held there in March 2002, it is the first permanent home for the awards. The Walk of Fame at the Hollywood Boulevard. Hollywood Boulevard, with the famous Hollywood Walk of Fame, more than 2,500 stars bearing the biggest names in the entertainment industry on its sidewalks. Disneyland, the "original", now named Disneyland Park, a must for Disney aficionados. La Brea Tar Pits and Hancock Park, titans of the ice age, fossil excavation site with an adjacent museum and a recreated prehistoric garden. Natural History Museum of Los Angeles County (4.5 billion years of history); Hollywood Bowl (live music); Universal Studios Hollywood (film studio and movie-themed amusement park); Getty Center and J. Paul Getty Museum (fine arts); Museum of Contemporary Art (fine contemporary art); Griffith Park (urban park) with the Griffith Observatory (observatory, exhibit hall, and planetarium); Muscle Beach, Santa Monica (birthplace of the physical fitness boom in the US). Just zoom in (+) to see LA City Hall, the center of the government of the city of Los Angeles and until 1964 the tallest building in Los Angeles. The page shows a city map of Los Angeles with expressways, main roads and streets, zoom out to find Los Angeles International Airport (IATA code: LAX), located in southwestern Los Angeles near Inglewood, distance from downtown: 18 mi (29 km), and the location of LA/Ontario International Airport, 40 mi (64 km) by road in Ontario, San Bernardino County. To find a location use the form below. To view just the map, click on the "Map" button. To find a location type: street or place, city, optional: state, country. Google Map: Searchable Map of the City of Los Angeles, California, USA. Most populated cities in the U.S.
Tallahassee | Tampa | Topeka | Trenton | Tucson | Washington D.C.
to pan the map click on the respective arrow on the pan button or click on the map and move your mouse/pointer to drag the map around (pan). to Zoom in +, or Zoom out – use the zoom buttons; or double click on the map to zoom in. Terrain, it displays a physical map with topographical details. with the option to switch Labels (names, borders, roads, business, etc.) on and off, for a combination of satellite image and street map. The "Pegman" symbol offers the switch to Google's street view, the 360-degree, panoramic street-level imagery. To enjoy street views, grab pegman with your cursor and hoover over the map, when street view is available parts of the map will change to blue, drop pegman there and you might have a lot of fun within unimaginable boring landscapes.